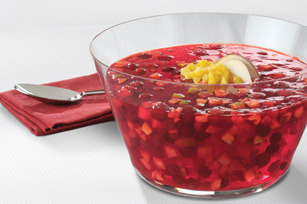 Try this Festive Cranberry-Pineapple JELL-O Salad! Crushed pineapple teams up with tangy cranberry sauce in this Festive Cranberry-Pineapple JELL-O Salad. Drain pineapple, reserving juice. Remove 1 Tbsp. pineapple; set aside. Add enough cold water to reserved pineapple juice to measure 3 cups; pour into saucepan. Bring to boil. Add to dry gelatin mixes in medium bowl; stir 2 min. until completely dissolved. Stir in cranberry sauce. Refrigerate 1-1/2 hours or until slightly thickened. Stir in pears, nuts and remaining pineapple. Refrigerate 4 hours or until firm. Top with reserved pineapple just before serving. Prepare using JELL-O Cranberry Flavor Gelatin or any other red JELL-O Gelatin, 2 pkg. (0.3 oz. each) JELL-O Strawberry Flavor Sugar Free Gelatin, or 1 pkg. (6 oz.) JELL-O Strawberry Flavor Gelatin. Slice an additional pear. Use to garnish salad just before serving. To serve as a molded salad, substitute a 6-cup mold for the serving bowl. Also, use 1 can (8-1/4 oz.) crushed pineapple, 1/3 cup chopped PLANTERS Walnuts and add enough cold water to the reserved pineapple liquid to measure 2 cups. Makes 10 servings, 1/2 cup each. Prepare using 2 pkg. (3 oz. each) JELL-O SIMPLY GOOD Strawberry Flavor Gelatin.